Miss a phone call? Rather than tapping through to the recent call log and finding the last caller, you can immediately return a missed call by swiping to the right on the phone icon alongside the callers name, directly from the iPhone lock screen. You’ll need iOS 5 or later and Notifications Center must be configured to include phone alerts to do this. The feature should be enabled by default, but if it’s not and you want to turn it on, tap to Settings > Notifications > Phone and make sure Notification Center is turned ON and alert style is set to “Alerts” or “Banners”. It’s a Saturday, AKA a slow news day. I’m sure everyone will be devastated by the loss of your useless comments on a free website that teaches you things you wouldn’t otherwise know. Well… I like the tip! 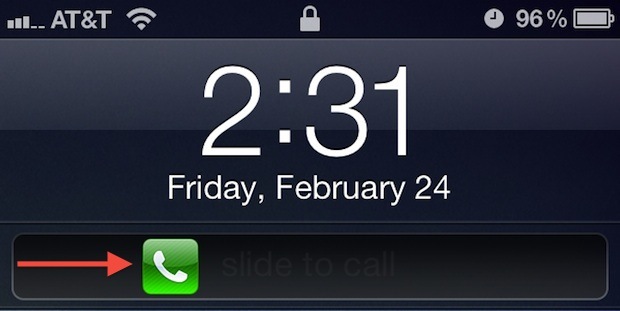 It had never occurred to me to swipe the missed call icon. This is very useful. Indeed, it is very useful. But the weirdest thing is that once I return the missed call and get done with it, the missed call notification is still there! THAT is what I want a fix for! Why would I still need to know about the missed call after I’ve returned it?! Ugh. Just found it. Saves an effort to unlock and then go to see the notification. Slow news day or not, it’s still a useful, little known tip for those who are unaware of it!